Increased temperature usually increases the solubility of solids in liquids. To understand why, we need to return to the Second Law of Thermodynamics. Increased temperature means a greater average velocity for the particles. This allows them to move from one position to another more easily. The greater freedom of movement allows the system to change its state more easily, and in keeping with the Second Law, it changes to the most probable state available, that is, the most dispersed state of which it is capable. Solids are condensed systems, so the dissolving of a solid usually leads to increased dispersal of the system. Therefore, although there are exceptions, an increase in temperature generally leads to an increase in a solid’s solubility. The table below shows the change in solubility with changing temperature for glucose in water. 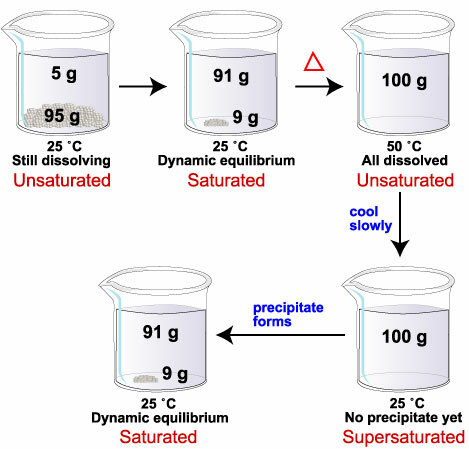 The change in solubility with change in temperature can be used to create solutions with more solute dissolved than is predicted by the solubility of the substance. For example, the solubility of glucose at 25 °C is 91 g glucose per 100 mL of water, and the solubility of glucose at 50 °C is 244 g glucose per 100 mL of water. Therefore, if we add 100 g of glucose to 100 mL water at 25 °C, 91 g dissolve. Nine grams of solid remain on the bottom, and the solution is saturated at this temperature. If we then heat the mixture to 50 °C, the remaining 9 grams of glucose will dissolve. At the new temperature, the solubility limit in 100 mL of water is 244 g glucose. With only 100 g of glucose dissolved, our system is now unsaturated. If we now slowly cool the mixture back to 25 °C, 9 g of glucose should precipitate from solution. Sometimes this happens immediately, but sometimes it takes a while for the glucose molecules to find their positions in a solid structure. In the time between the cooling of the solution and the formation of glucose crystals, the system has a higher amount of dissolved glucose (100 grams) than is predicted by the solubility limit at 25 °C (91 grams). Because the solution contains more dissolved solute than is predicted by the solubility limit, we say the solution is supersaturated.